Pickup Some Creativity: Give Thanks. Last weekend, I was able to watch church services in my bed. It was pretty awesome. So while I listened, I doodled. I've been interested in typography for a while, and LOVE the work of Katie Daisy, which you can see all over pinterest...and even on Under the Sycamore's blog design. I have wanted to make something fun for the living room wall, and listening to words of respected people urging me to be better was a great time to do it. I just used my prisma colored pencils, and played with a couple different types of designs. I just got them framed yesterday, and up on the wall today. They are not as bright as I'd hoped...so I may have to try a different type with paint next version. They seem a lot more muted on the wall. However, I wanted to share these designs with you. So many of you have kindly supported me as we built our home, and have shown concern and love as I wind my way through diabetes. I give thanks for each of you. If you'll follow this link, HERE, you can download a pdf version you can print and frame for your own home. I hope you enjoy it! Nice job - giving thanks is the first step to humility. The idea of true humility has been on my mind lately and I read that giving thanks is the first step to humility. I like how the colors you chose for the typography pick up the colors of the throw pillow. They are beautiful! Great job. I love the message too. It's fun to try your hand at something new. You've done well. Both are very pretty indeed! Great worth, was it fun to work in a different medium? the other day I painted with an artist brush and it was so much fun. Im just learning about Katie Daisy, she is so talented, and the colors she uses. 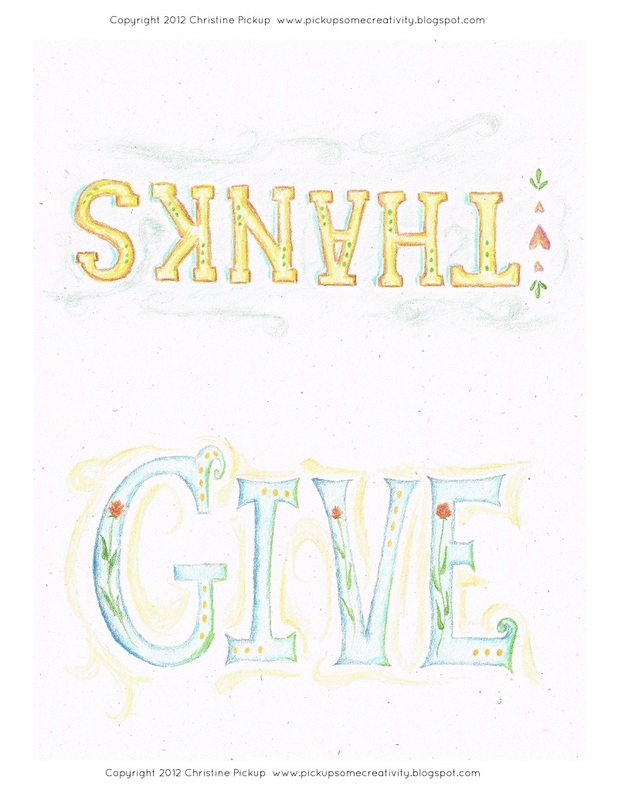 And Give thanks have to be 2 of my favorite words, a great reminder for everyday.